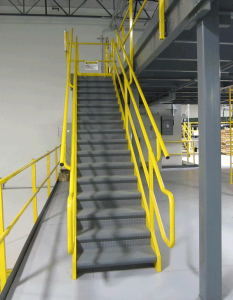 Complete your mezzanine, elevated platform or steel structure with mezzanine accessories engineered and fabricated to perfectly complement your structure. Our accessories are all designed and built to prevailing codes. We design to IBC specifications and requirements of the Americans with Disabilities Act (ADA) as well as OSHA safety standards. OSHA standards regarding caged ladders that changed in November 2018. Check out our FAQ page for details on stair run calculations, stair landings, the number of stairs, ladder cage requirements, hand rail vs. guard rail, and more.